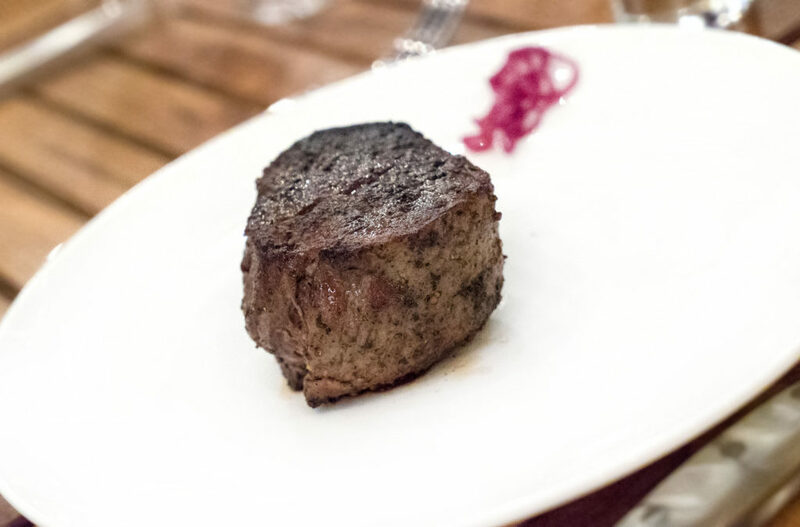 Etymology: Filet, in culinary terminology, means boneless. Mignon, in French, means dainty or small. As such, this is a steak ideally suited for chicks: small/dainty, and with no bone. 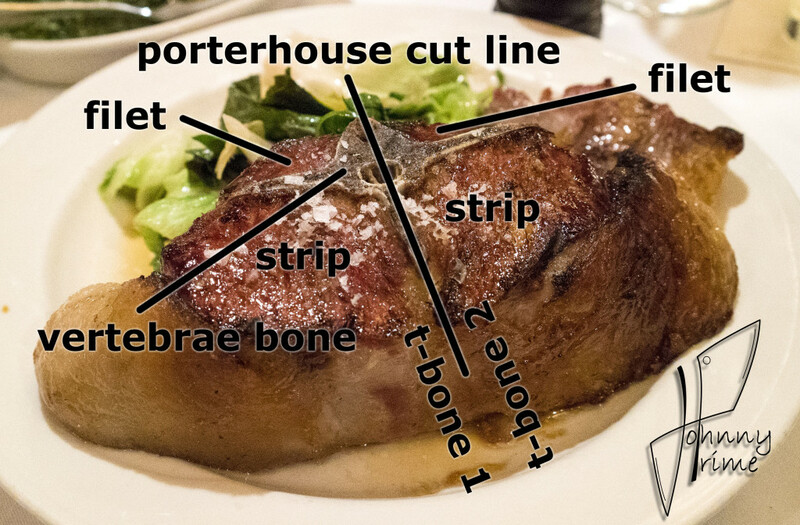 Occasionally on a steakhouse menu you will see a “bone-in filet.” Given what I just mentioned above, that phraseology is completely self-defeating and confusing, as it simultaneously means both “bone-in” and “boneless.” However, it seems this sort of language is becoming commonplace. If it were up to me, I would prefer “bone-in tenderloin” to be listed on menus instead. There is no wording conflict with that phrasing, and it is an accurate description of what is being presented. In other words: all Filet Mignon is tenderloin, but not all tenderloin is Filet Mignon. Anatomy: Traditionally, a Filet Mignon was cut from the anterior end of the tenderloin. 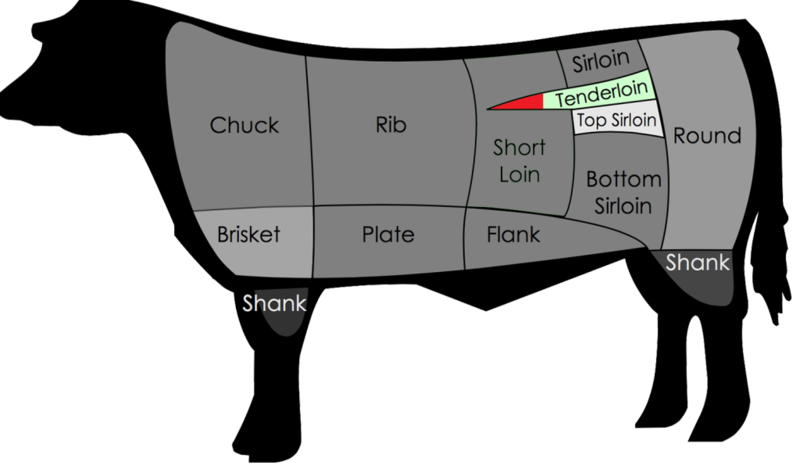 In the beef chart image below, you can see a portion of the tenderloin section highlighted in red. That is where Filet Mignon was typically located, though most butchers label all steaks cut from the tenderloin as Filet Mignon (this allows for larger portions). The tenderloins run along both sides of the spine. They taper from thick, in the posterior of the animal, to thin in the front. In their unbutchered form, they contain what’s called the “silver skin” still attached to the flesh. This is a thick connective tissue that is pretty much inedible. When butchering the full tenderloin, you will want to slice that off (it is NOT tender). Preparation: Preparations of this cut vary greatly. You may see this cut sliced thin and pounded flat, served raw for carpaccio. You may also see it finely chopped for tartare. A simple pan sear with butter and herbs, however, is probably the most common preparation. 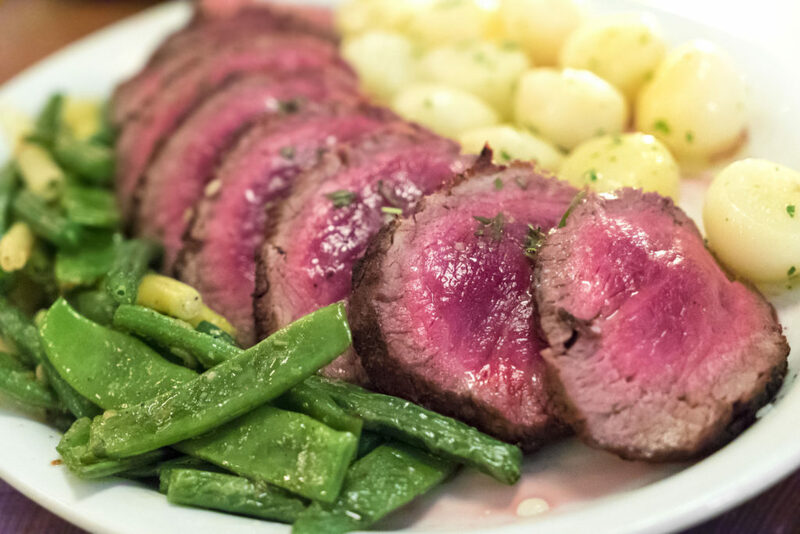 Yet another style is Chateaubriand, which is a large section of the thick portion of the tenderloin that is roasted boneless, then sliced and served with a reduction sauce. There is also Beef Wellington, which is a portion of tenderloin that has been coated with pate and then wrapped in puff pastry dough prior to cooking. Flavor: Widely considered the most tender and least fatty cut of beef on the animal, the flavor should be uniform from one end to the other, with very tender and soft texture the whole way through. 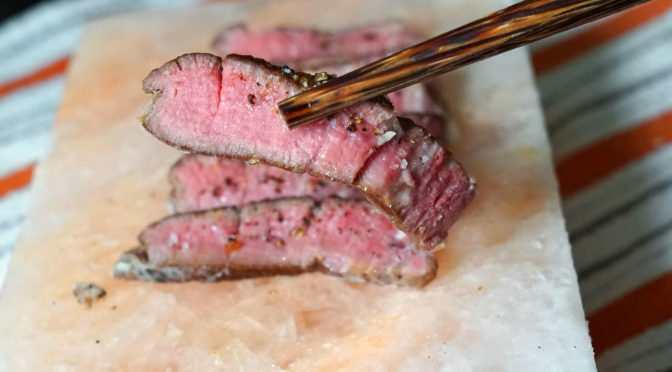 There is hardly any fat content in the standard cut of Filet Mignon. Some chefs will wrap the filet in caul fat (a lacy, fatty, web-like membrane that surrounds the stomach of an animal) before cooking. The webbing melts away during cooking and imparts a fat flavor into the meat. But it is more common to use things like butter, or to wrap a filet in bacon to add the fat flavor into the meat.